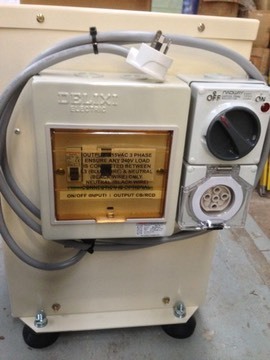 Ever wanted to be able to run a 3 phase 415V machine from a single phase 240V outlet? Well, now you can, very simply and quickly with the Light Horse series three phase power converters from Phase Change Converters. We are an established Australian manufacturer of 3 phase power converters - in fact that is all we do, so we can assure you we do it well! Our three phase converters provide quality noise free 3 phase power, and can be used to power ANY three phase equipment, just like you would with permanently connected utility power. These are not back yard 'knock together' converters. All are professionally built with quality components, in a powder coated steel enclosure, well labelled, and have Australian C-tick approval. The Light Horse series, as the name suggests, is designed for smaller Horse Power applications and is available in 3, 4 and 5HP configurations. All look identical, designed as a '240V-plug-in' to '3-phase-socket-out' converter, these are the easiest converters to use on the Australian market today. Unlike some other conversion techniques, Light Horse converters provide a true 415V 3 phase output (not 240V 3 phase) and require no programming or special settings to be made before use. Light Horse converters come standard with internal thermal overload and input circuit breaker protection. An RCD (safety switch) protects the 3 phase outlet. Based on the well proven rotary conversion technique, and using modern controls, each converter is guaranteed by us for 12 months from date of supply. In addition, provided we have first discussed the planned application with you, we also provide a 30 day guarantee of application suitability, meaning that whichever model you purchase from us we guarantee it will power and work your machine properly. For Example, the Light Horse 4, has been designed for a single load or for multiple loads to a total of 4HP or 3KW. The recommended maximum starting single motor load for this model is 2.2KW (3HP) for light mechanical loads and 1.5KW (2HP) for heavy mechanical loads. Multiple motors can be connected to a total of 3KW or 4HP provided they are started at different times. Use the table below for ratings on each model. Note that Light Horse series converters are more basic than the Phase Changer series and do not have the tight phase to phase voltage tolerances found in the Phase Changer range, meaning that motors may run hotter and hard starting loads are not ideal. However they are a lower cost option and quite suitable in many applications. For applications where you need more power, need better phase voltage balance, require hard start and boost capability, or have a 480V supply the Phaser Changer series may be for you. 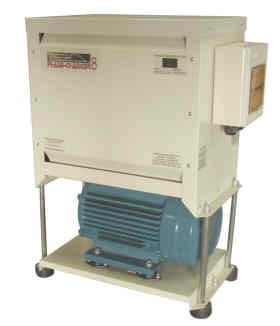 The Phase Changers are unique high performance converters, with models ranging from 2-45KW.